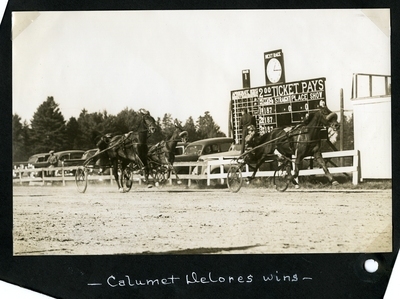 Black and white action photograph of bay mare, Calumet Delores wearing head number six, Berry up winning the first half of the Daily Double, the 2.15 Pace on Friday, October 7, 1938 at the West Oxford Agricultural Society races, Fryeburg, Maine. Placing in second is brown gelding Amor Patch, wearing head number five, Larochelle up. Showing in third is chestnut gelding, Hal Volo, wearing head number four.